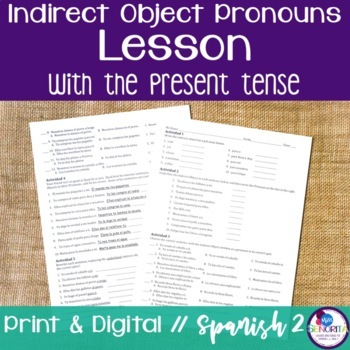 This zip file includes everything you need to teach a lesson on indirect object pronouns with the present tense. The powerpoint teaches what the indirect object pronouns are in English, and then in Spanish. 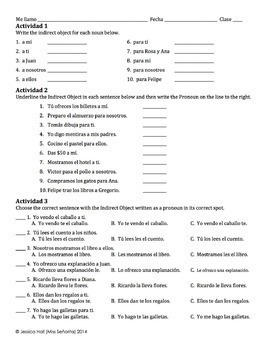 Then there are sentences for students to practice rewriting sentences substituting the indirect object with its pronoun. The notes page has blanks in it for students to follow along with the powerpoint. All the documents (except the powerpoint) are Word docs, so they are editable for any curriculum. The powerpoint is saved as both .ppt and .pptx. 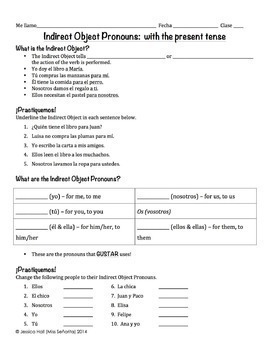 This lesson is ideal for a Spanish 1 or 2 class in middle or high school. 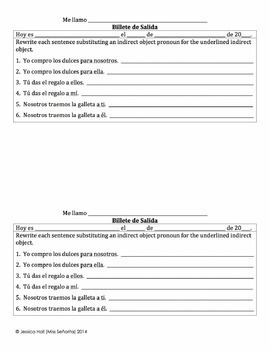 This lesson is included in my Spanish Direct, Indirect, and Double Object Pronouns Bundle with the Present Tense.